Aidan Hart is an icon painter, carver and mosaicist, with works in over twenty countries of the world. He has also written and spoken widely on icons, ecology, asceticism and the arts. A subject to which he often returns is how the theology and making of icons offer a paradigm for the Orthodox Church’s understanding of ecology. As well as numerous articles, he is author of two books: Spirit, Beauty, Matter: Icons in the Modern World (2014) and Techniques of Icon and Wall Painting (2011), the latter widely regarded as the definitive book on the subject in the English language. 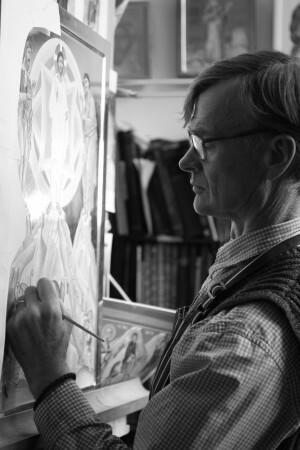 Aidan founded and teaches the Diploma in Icon Painting, run by The Prince’s School of Traditional Arts. He has a degree in literature from the University of Auckland, and studied modern Greek at the University of Aristotle, Thessaloniki. Aidan lives in Shropshire, England, with his wife and two young children.